Owing a multipurpose website template is the best way to help you create any kinds of website that you can imagine. Born to be multi-tasking, all these types of websites perfectly promote you to publish your personal blogging site, portfolio, corporate, and eCommerce site. It’s no doubt that the versatile website comes with all must-have factors which every website need such as: completely responsive, various fit features for promoting products and services, creating professional portfolio ability, social network integration, eCommerce support and much more. Also, one of the best ways to polish and promote your reputation is making use of multipurpose website’s benefits. In this collection, we have left out all the bad, ugly versatile themes which make you get lost and remain the Top 10+ Best Responsive & Premium Multipurpose WordPress Themes. Please check out this list before you make the final decision! Evolution is an ideal, clean and modern WordPress creative multi-concept theme for anyone to start an online business. Perfect for selling items in a lot of different aspects such as Electronics Devices, Digital, Watches, Headphones, Furniture, Fashion, Food.. or everything you want. With 08+ eye-catching layouts, amazing styles and multiple header & footer styles together with 22+ premade elements built-in helping you display your stores impressively and professionally. Free to choose any demos you want. What’s more! 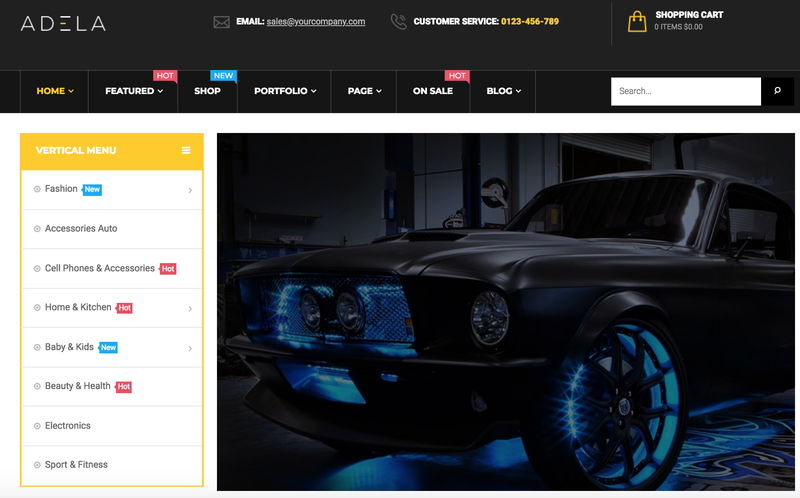 This great multipurpose theme is fully responsive on any devices, completely optimized for Speed, Search Engine Optimization, Mobile Optimized, Highly Conversion Rate Optimization, and Unlimited Customize. Especially, Evolution is well structured and clean code, ensuring a smooth user experience. Last but not least, it becomes powerful by supporting Revolution Sliders, Unlimited Color Skins, Font Awesome Icons, Ease of Customization, Dynamic Megamenu & Vertical Menu, King Composer, Powerful Search & Filter, One Click Installation, RTL Languages Support. 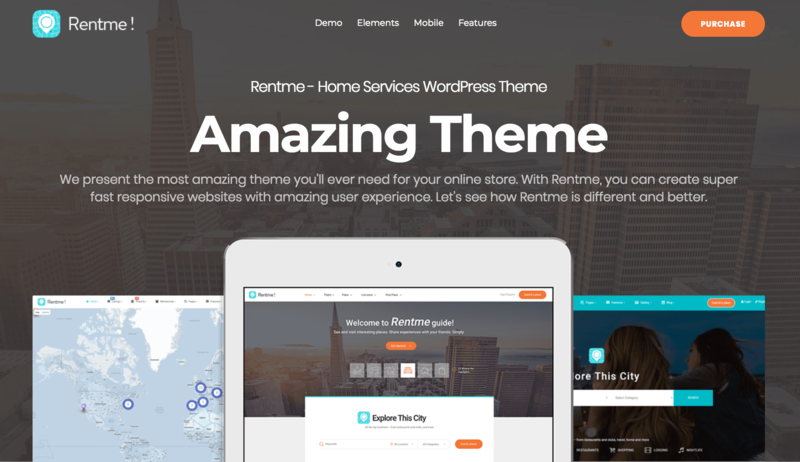 Rentme – Directory & Listings Multipurpose WordPress Theme is well-built to help you establish an online directory portal of any purposes such as companies, shops, real estate, restaurant, travel, club, lodging, nightlife, hotel, resort, culture, cuisine… Along with a good rating of experiences, feedbacks, reviews, ratings from users or buyers, it becomes a Membership system with membership packages. That means users can register and post listings on your websites, similarly as a small Directory of various points bringing the whole world into your life. With a modern and creative design made by Themelexus, Rentme inspires users with 04+ homepage layouts imported by 1-click. Experiencing the feeling of a traveler to immerse yourself in dream places with this beautiful theme on the way of exploring by so many different ways such as Search Places with Map & Form, Property with Sliders, with Banner or List Users. In addition, it allows users to be able to manage their existing listings from the frontend or can edit, delete or update them by the support of Opal Listing, Opal Membership. There are also so many choices for users to display properties detail layouts impressively. King Composer, Slider Revolution, One Click Installation, RTL Support, WooCommerce Products Filter, WooCommerce Bulk Discount, WP user Avatar, Snazzy Maps, Monster Widget are the things that you shouldn’t miss out of Rentme. Adela is an engaging responsive multipurpose eCommerce WordPress theme powered with WooCommerce. It is outstanding over others with tons of premade concepts such as 09+ unique demos, multiple header styles, multiple product views and lots of prebuilt widgets to display blocks of content in the smartest way. One-click Demos Installation, Fully responsive, fast speed page loading, page builder no coding required, SEO optimization is all the powerful functions that don’t make you disappointed. Owen the greatest multipurpose WordPress theme on the market thus far will bring your customers awesome shopping experience for each time visiting. Simultaneously, it is created with High Conversion Rate in mind to start selling online fast and effectively. Featured with one of the best Page Builder, it will be super easy to create anything without coding. It comes with modern design and different layouts, unlimited possibilities to create your own beautiful website. Also, it’s the good choice because of the Better Performance, SEO Optimized for better ranking, Multilingual & RTL Languages Ready for expansion. Beyond fully responsive on any devices, Owen is perfectly superb mobile experiences. The 1-click importation will help you replace our demos on your server quickly. Build your own amazing site with a diversity of homepage demos imported by 1-click. Econo is one of the best Creative Multi-Purpose WordPress Theme built using HTML5/CSS3 features and suitable for creative companies, agencies, and freelancers which need a professional way to showcase their projects, services, and sell their products. What’s more? It is equipped with 18+ unique handcrafted homepages imported easily by 1-click action, created by Visual Composer page builder, no coding required. There is no doubt that Econo can perform well on different devices with sharp images and optimized speed. Built with the latest Bootstrap responsive framework, Econo is released to meet customers’ requirements to find a light awesome, powerful, and easy to use the theme. Poeme is a flexible Multipurpose Theme suitable for Fashion, Food, Home Rugs, Pottery, Vegetarian Seeds & Nuts, Decoration. It is so impressive with 06+ Modern, Charming Homepage Demos creatively supported by the powerful Elementor Page Builder with Drag & Drop Widgets struck with Diverse eCommerce functionalities. Not only be different with perfect appearance, but it is also outstanding by all functions supported inside. Real-time customization and see its changes immediately on the frontend is one strong function of it. With variously available widgets, you are well supported to illustrate your business research services in the best way. Also, it’s easy to install and import demos with One-click Import tool. Everything will become easier with Poeme due to an extremely responsive, fast-loading, SEO-friendly Versatile WordPress Theme. Cuber is a creative, responsive, lively and multipurpose WordPress theme for any kind of websites. It helps you to create sites for a wide range of businesses and styles, meeting all requirements for the trending. Designed in a clean and minimalistic style and packed with a lot of useful features, options, and shortcodes, it will definitely an ideal choice for you. Be compatible with premium plugins such as WPBakery Page Builder, Revolution Slider, and ACF Pro, which helps you to create beautiful pages fast and easy without coding. Especially, it’s performed incredibly on any devices, which reduces the time and work required to launch your website. 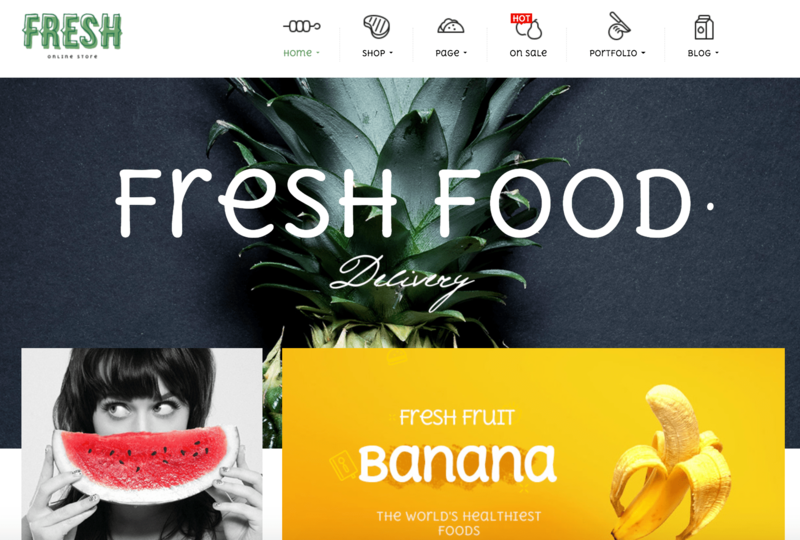 Fresh – The mark of a good multipurpose WordPress theme is a clean and minimum Food & Restaurant eCommerce theme. It is dedicatedly built with creative design, ultimate core features and ease of customization. Using powerful basic platform of Woocommerce, it has 3 demos with different layouts and style, all required shop pages and a number of CMS pages to build powerful eCommerce site your ways. Impressed with the 1-click installation, it allows you to build any demos with single & simple actions. This theme is easily customized based on the intuitive theme control panel, providing you with lots of useful options to manage your site. Fresh food Woocommerce theme is SEO friendly & optimized, ready codebase to maximize your site performance. FSHOW – one of the most innovative Multipurpose eCommerce WordPress Theme of Opal team built with WooCommerce platform. Including 4 amazing pre-built sites with different design concept, layout, style and color, it will not absolutely make you disappointed. More than that, it is fully responsive, every single element is designed to have outstanding look and feel in all popular devices. This dynamic versatile theme has it own intuitive theme control panel that includes lots of built-in functionality to manage your site. Over the others, some additional pages Portfolio, Blog … and pre-built shortcodes are perfect to build content easier. Farvis – the innovative Multipurpose Niches WordPress Theme is perfect for different purposes such as business, yoga, consulting, cryptocurrency, security, building, wedding, garden, phone repair, medical, plastic surgery, water delivery and more .. Impressed everyone by 100+ ready-made elements with blocks of information which you can combine to create any design. User-friendly appearance helps you navigate and find with ease all the information about your business, goods or services, prices, terms, and conditions, etc. Header and footer can be easily modified by using page builder Visual Composer Drag & Drop. Being modern, stylish and simple is what makes Farvis outstanding.